Within the project for cross-border cooperation "Entrepreneurial Club" a seminar on "Entrepreneurship and development of a business idea" was held in Kriva Palanka from 5th to 7th June 2014. It was attended by 16 young people up to 29 years, which generate more than 40 business ideas, and decided to continue to work on 15 of them, selecting them according to the methodology presented in the seminar. At the end of the seminar young formed Entrepreneurs Club- Spectrum, to prepare them better for the best business plan contest that will take place in Bulgaria and Macedonia. Combination of learning, exercises and field work. Methodology which confirmed that huge potential lies in young people, which can be put into operation for their needs. Applicable tools together with great enthusiasm and creativity completed with excellent results. A 5-day seminar on "Entrepreneurial and business skills in the field of energy efficiency" was held on May 22 and 23 and May 28 and 31. Participants of this seminar - managers of small and medium enterprises were familiar with the latest market trends, the supply of energy efficiency measures for buildings and the methodology for developing the business models of the participants. At the end of the seminar, information for available sources of funding for businesses in the energy efficiency sector were presented. On May 27, 2014 in Skopje, seminar was held on "Advanced skills for decision-making." Participants from small and medium enterprises in Macedonia were familiar with the factors that affect the decision-making and execution, criteria that distinguish individual styles of management and communication. During the seminar, participants worked on many effective techniques used in the decision-making and execution through exercises. Within the project "Explore your surroundings and discover her most dangerous and most damaging effects" on April 11 and 12, 2014 in Sandanski, Bulgaria, seminar on “Economic costs to a healthier environment and mission of future generations for a safer and healthy living environment” was held. Teachers in secondary schools in Valandovo and Sandanski built capacity for presentation the economic aspects of environmental protection to the students, in order to raise their awareness of taking concrete actions in the area. On March 27 -28 and from 3th to 5th April, 2014 a five-day seminar on “Entrepreneurial and business skills in the field of energy efficiency” was organized. The seminar was organized as part of the Energy Efficiency in the housing sector, conducted by HABITAT Macedonia and USAID.35 participants (entrepreneurs, employees in construction companies and financial institutions, as well as unemployed) actively participated in building their capacity for business planning, using applicable knowledge and tools to develop a business model of energy efficiency sector, and evaluate the viability of selected business. On March 14,15 and 25, 2014, at the Economic Chamber of Macedonia a seminar was held for developing projects that lead to results. The innovative approach to building capabilities allow participants to recognize their skills according to the phases of the project cycle and to focus on those that will enable the best results. On February 21, 2014 at the training center C.E.S Skopje, a seminar on “Leadership, building and leading a team” was held. The trainer, Risto Ivanov, was presenting global trends in leadership, the importance of leadership in the growth of the individual and the business and led participants to prepare its own leadership plan. During the seminar, participants gained an understanding of leadership competencies to deliver services to consumers and skills for selecting, building and leading a team to realize the goals of the leader. On February 12, 2014, in Hotel Tiveriopol Strumica and on February 19, 2014, in Hotel Apollonia Gevgelija, two seminars on "Management skills" were organized by SI Communication and The Center for Development of the South-East region. Risto Ivanov presented to participants, managers and employees of micro, small and medium enterprises, the importance of management skills in running a business, how to measure success in managing the business and relationship between management skills and goal achieving of managers. On February 12, 2014 in municipality Kisela Voda, a workshop for establishing strategic priorities and selection of projects for their realization was organized. Participants, who were employed in the sectors of municipal administration, were involved in the development of the strategy for local economic development of the municipality and through interactive discussion identified the strategic priorities for the next four year period, suggesting the necessary projects for their realization. 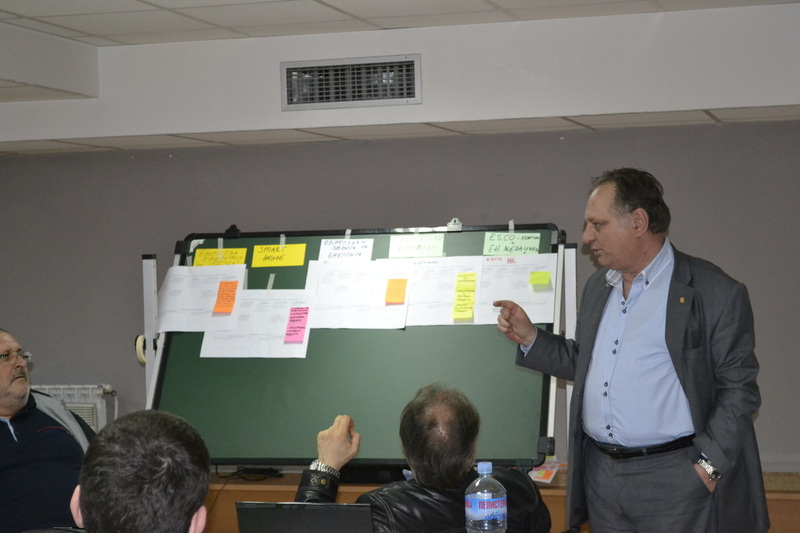 From 14th to 15th November 2013, at MKC Skopje a seminar was held on "Skills for Project Management" where trainer was Risto Ivanov, PhD in Economics, Certified Management Consultant (CMC) and Professional Project Manager (PMP). The two-day seminar encouraged the participants to present their ideas and to realize them in the future, in the form of projects. On March 12 and 13, 2014 in Mavrovo, a seminar was organized on EU Donation procedures, in which participants had the opportunity to learn how to access donation development programs and with forming successful partnerships to identify a project idea. Through application of tools for preparation of the project application, according to the donors, participants learned key skills in project management. Also, the seminar combined theory, practice and play in order participants to apply the acquired knowledge to generate project ideas and develop grant program application.